A function can have one or more parameters of different data types, but what if you want to pass a function itself as a parameter? How does C# handle the callback functions or event handler? The answer is - delegate. A delegate is like a pointer to a function. It is a reference type data type and it holds the reference of a method. All the delegates are implicitly derived from System.Delegate class. A delegate can be declared using delegate keyword followed by a function signature as shown below. The following example declares a Print delegate. The Print delegate shown above, can be used to point to any method that has same return type & parameters declared with Print. Consider the following example that declares and uses Print delegate. In the above example, we have declared Print delegate that accepts int type parameter and returns void. In the Main() method, a variable of Print type is declared and assigned a PrintNumber method name. Now, invoking Print delegate will in-turn invoke PrintNumber method. In the same way, if the Print delegate variable is assigned to the PrintMoney method, then it will invoke the PrintMoney method. The following image illustrates the delegate. The delegate can be invoked like a method because it is a reference to a method. Invoking a delegate will in-turn invoke a method which id refered to. The delegate can be invoked by two ways: using () operator or using the Invoke() method of delegate as shown below. A method can have a parameter of a delegate type and can invoke the delegate parameter. 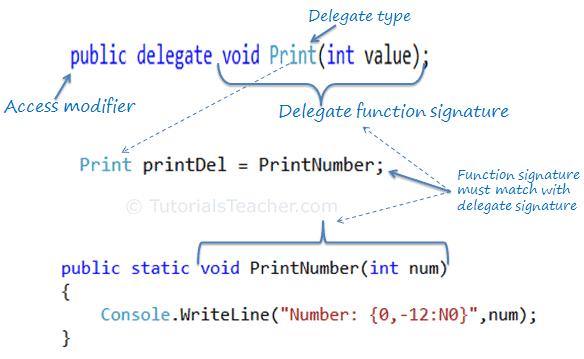 In the above example, PrintHelper method has a delegate parameter of Print type and invokes it like a function:delegateFunc(numToPrint). The following example shows how to use PrintHelper method that includes delegate type parameter. The delegate can points to multiple methods. A delegate that points multiple methods is called a multicast delegate. The "+" operator adds a function to the delegate object and the "-" operator removes an existing function from a delegate object. As you can see in the above example, Print delegates becomes a multicast delegate because it points to three methods - PrintNumber, PrintMoney & PrintHexadecimal. So invoking printDel will invoke all the methods sequentially. Delegate is also used with Event, Anonymous method, Func delegate, Action delegate. Delegate is a function pointer. It is reference type data type. A method that is going to assign to delegate must have same signature as delegate. Delegates can be invoke like a normal function or Invoke() method. Multiple methods can be assigned to the delegate using "+" operator. It is called multicast delegate.